One of Hoboken’s most recognizable images was the faded, illustrated billboard pointing you toward the old Clam Broth House, a staple in the borough that dates to past decades. But as the rest of the area gets rejuvenated so must this formerly iconic staple, and in its ashes rises a new flame. Enter Biggie’s Clam Bar, a massive bar and restaurant that adds a polished touch up to the old neighborhood relic, giving locals and commuters a spot to stop near the Path, but off the beaten path. The bright red cursive signage flashing out into the street proudly displays the Biggie’s moniker, as several patio tables line the place’s exterior for warm weather days- ideal, if you can secure yourself a seat. Inside, Biggie’s has a very excitable energy about it. Perhaps it was because we ducked in before a recent concert when seemingly every bar was swarming with people, but the area was packed nonetheless. 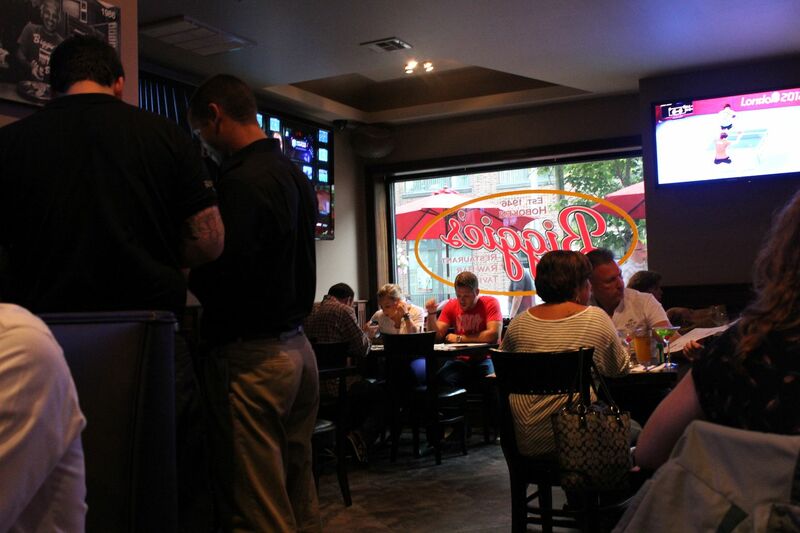 There are flat screens mounted all around the bar area, making this yet another prime place to be on those Sunday afternoons. Although my party stopped into Biggie’s primarily to check out the bar, we managed to get pretty hungry and after a short wait, plopped down at a table for some food. The place serves up a pretty extensive menu of fresh seafood as well as some hearty sandwiches and comfort foods. Fast forward to us chowing down on a meatball parmesan sandwich and a fresh tuna wrap, and our appetites were immediately appeased. We washed the food down with some of Biggie’s competitive happy hour prices, which differ just about every night of the week. 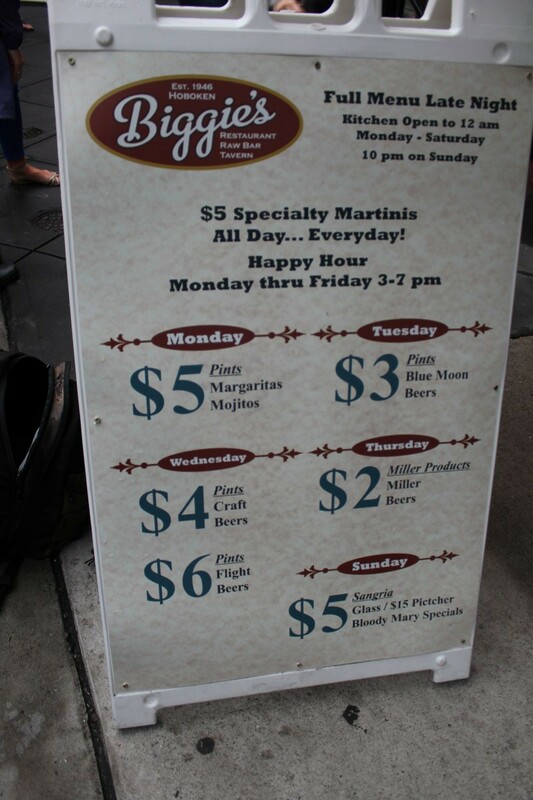 Thursday’s $2 Miller products, and Tuesdays $3 Blue Moon beers are among the highlights, alongside $5 specialty martinis served up every day of the week. After a few Miller Lights, it was time to settle up and head on out. Preconceived notion – This was always a location I took note of, but never managed to patronize. 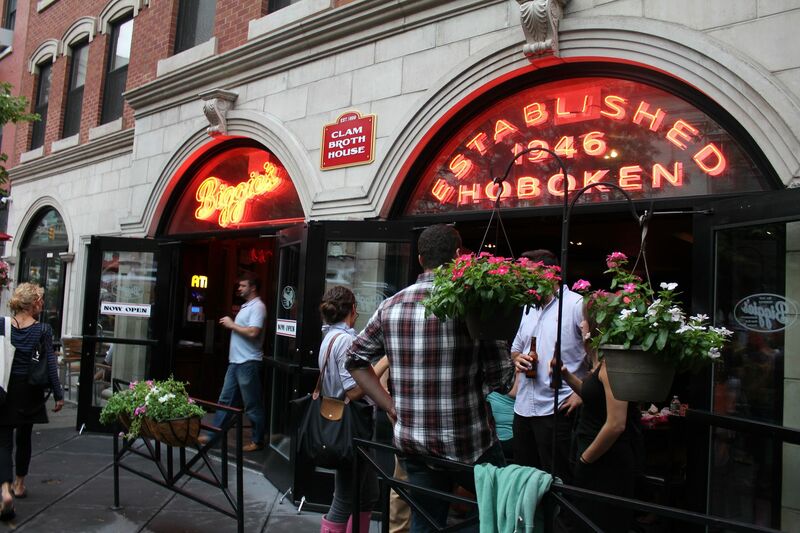 The historic place was and is a Hoboken staple. Bar Type – More of a restaurant with a big bar setting. 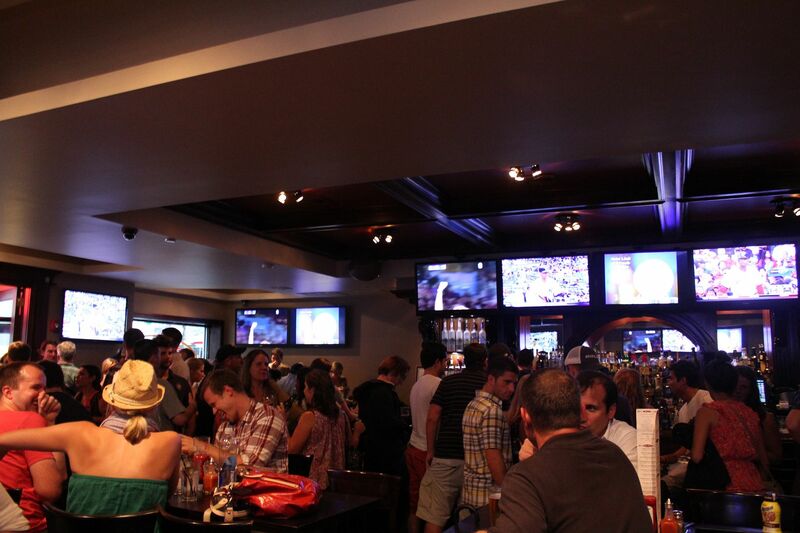 Crowd stereotype – Lots of young families with their kids dining, but the bar was jam packed with groups of friends. Music – The bar and restaurant were both packed and pretty loud so I couldn’t hear the rest of my party, much less the music. Value – The values are better on some nights than others, but overall nothing sticks out as much more expensive than any other local bar. Date – Certainly not the fanciest of spots, but on a tamer night, you can absolutely grab a table for two here. Hookup – You never know. With a full late night menu and a kitchen open until 12am most nights, buy her those chicken fingers and she’s yours. Dance – Not on this night. Catch up with a friend – Probably best suited for this. First or last drink of the night – Ideal for a first drink, or if you’re stopping before heading into Manhattan. Overall – This is just one of those places that is part bar and part restaurant that are tough to quantify. The values were fine, the place was packed, the food was acceptable, and it looks like a relatively new bar from the inside. Biggie’s is absolutely fine as a meeting spot for big groups considering the sheer size of the place and of the bar area. But I just don’t know that I got enough out of this visit to warrant a return trip back, when I found other spots to be more accommodating. Until I give it another shot, Biggie’s gets an 8.3 from this humble writer.